Loverly is notated. That’s the third CD with all its music notated — woo hoo! I am waiting to hear about publication rights. If I don’t hear soon, I’ll put out the Under the Greenwood Tree book as an ebook without Loverly. A different “and then there was one”: there is only one CD still waiting for me to notate its music: Drivin’! Some of those pieces have lots of notes. With the pdf publication yesterday of How Hope Became Love, the only piece left for transcription from Under the Greenwood Tree is Loverly. Please wish me luck getting a license for Loverly, my arrangement of Lerner & Loewe’s Wouldn’t It Be Loverly. WIthout the license I cannot publish my version; I’ve been refused a license for Gershwin’s Summertime recently, so I’m a bit concerned. Different publisher, though; maybe that will help! Anyway, with or without Loverly, the Greenwood Tree book will be out in a week or so. If I were less stunned, I’d be jumping up & down. I am rather jumping up & down inside. But now: start the new score & notate. Because today I’m puzzling out each note! 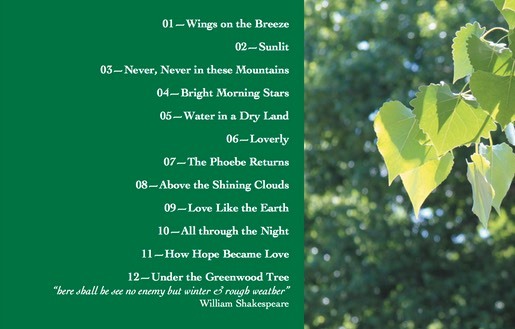 Mock-up of back cover of Under the Greenwood Tree. How Hope Became Love really is a beautiful piece (I would of course think that) which for some inexplicable reason I have neglected to play ever since I recorded it in (cough cough) 2009. Unsurprisingly, I am not remembering it very well. The good news: I had written sections of it down in my sketchbooks. I can see that I got some rhythms wrong (or perhaps I changed them later), but still, I’ve notated in Sibelius everything that was in my sketchbooks. The bad news: How Hope Became Love is an intricate and long piece and there is plenty of music I didn’t write down and I am listening to it again and again and still am not sure what I played. Bah! Even with the help of the Amazing Slow Downer. Bah!! I understand why I haven’t performed it in the last 6 years: at nearly 7 minutes, it is too long to fit into 2 20-minute sets in a shared concert where telling stories about the music is also expected. But why oh why haven’t I at least played it? Even 3 times a year would have kept it in my hands. Bah!!! I feel like I have written that before! 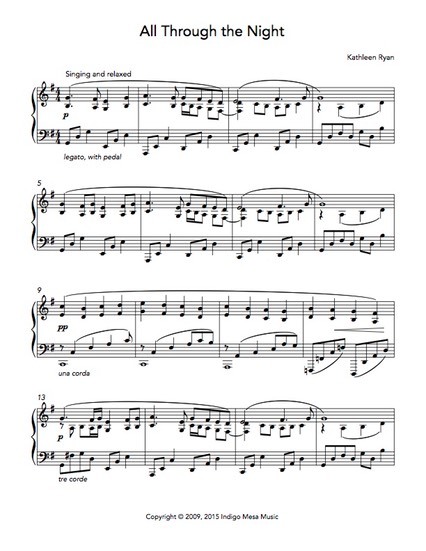 I just published the sheet music for All Through the Night, from Under the Greenwood Tree, in my store, here. Only two left to notate & then there will be a book. Woo hoo! were, I hope, had by all. When this performance was scheduled, no one knew that the Art Council would have just purchased a historic Mountainair property to serve as an art and community center. So, we combined the Member Appreciation event and the housewarming into one big par-tay. Happily, that gave me a focus for choosing music for the program. 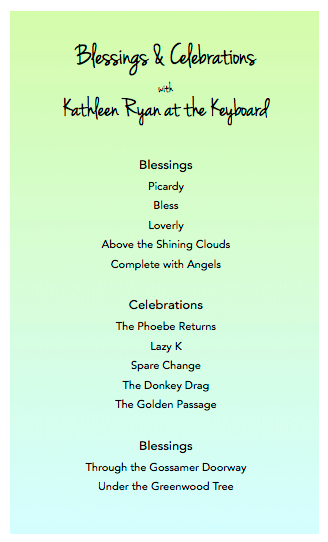 R-T-G & I had already decided it would be my last performance on the keyboard: in the future, real pianos only for me! * Still, it was great to go out with a good one; the keyboard & I were in such harmony last night, I was almost thinking I could do another…. No, what am I saying? From now on, only real pianos for me! *What I consider to be my real talent as a pianist just isn’t possible on any keyboard I’ve met to date, so to offer listeners my best music I really really need to be playing a good piano. 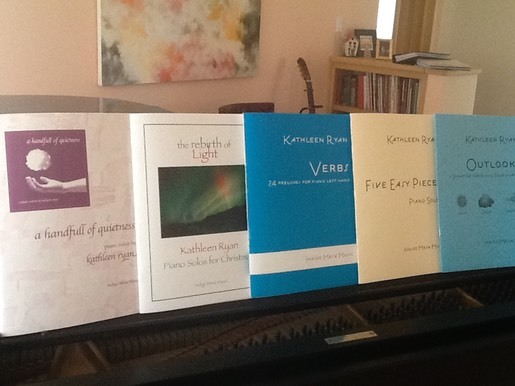 Well, this is the expected result: a bunch of books with my music in them! 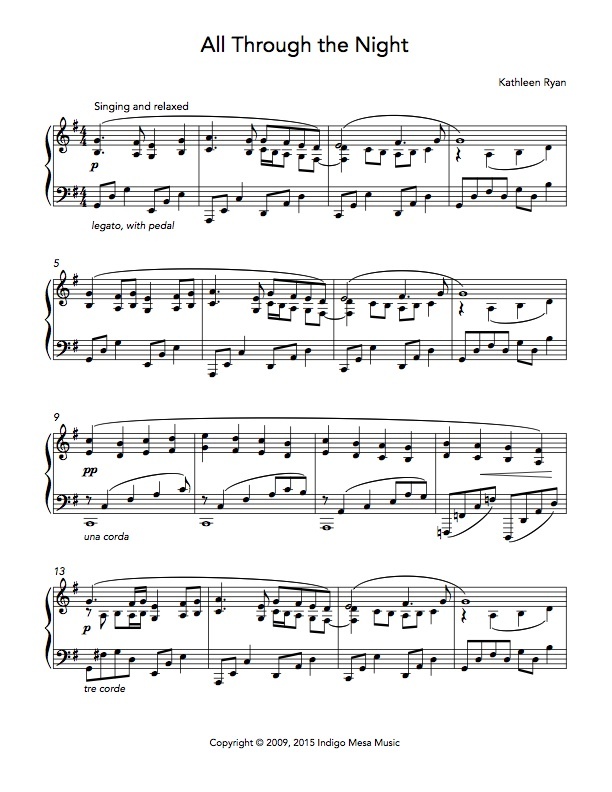 I have finally “turned the corner” on notation and am now stalking the remaining pieces yet to be written down. Actually having a published edition of A Handfull of Quietness — at unbelievably long last — is so thrilling! “Oh! That’s why I’ve been doing all this,” my only-in-the-moment brain says. “Yes, and here’s another piece to work on,” I reply. Three to notate and then all of Under the Greenwood Tree will be published as well. So fun!! !